Anchor Insulation is proud to be the most comprehensive industrial insulation company within the states of Rhode Island ( RI ), Massachusetts ( MA ), and Connecticut ( CT ). We are the leading provider of industrial insulation and related services to public utilities and co-generation plants. These industries along with heavy and light manufacturers make up a large percentage of our loyal commercial base. Anchor Insulation’s trained and experienced outage crews are experts in high temperature applications and are especially skilled in metal fabrication. These crews travel nationwide in support of our customers. 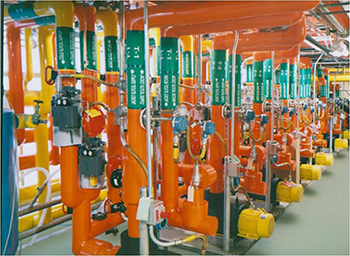 Anchor Insulation provides a full range of commercial services including thermal conservation, chilled water, HVAC and sound control for production operations and the research development sector. We are a leading supplier of customized reusable industrial insulation blankets. Each of our locations has its own fabrication shop for rapid and responsive fulfillment of every custom order. Anchor Insulation is the enhanced performance specialist for durable insulation solutions in harsh environments. We look forward to speaking with you about any challenging insulation application and can assist you at every stage from design, to implementation through the operation and the maintenance cycles. Contact us for all of your industrial and mechanical insulation project needs.